A Virtual Private Network (VPN) is a connection between two endpoints – a Linksys ADSL gateway, for instance – in different networks that allows private data to be sent securely over a shared or public network, such as the Internet. This establishes a private network that can send data securely between these two locations or networks by creating a tunnel. A VPN tunnel connects the two PCs or networks and allows data to be transmitted over the Internet as if it were still within those networks. This tunnel is a connection that is secured by encrypting the data sent between the two networks. Before connecting to a VPN tunnel you need to ensure that there is an active Internet connection on the Linksys ADSL gateway. After ensuring that there is an active Internet connection, you need to verify the VPN settings. To verify the VPN settings of the Linksys ADSL gateway, follow the instructions below. 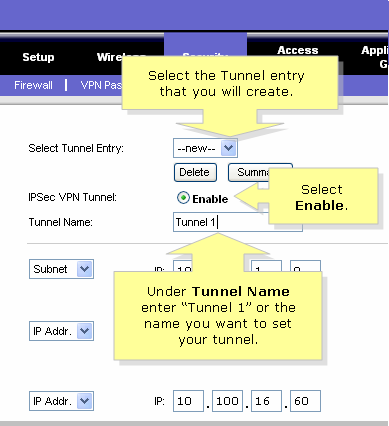 In order for you to successfully configure a VPN tunnel, you need to take note of the settings needed to set-up a tunnel. 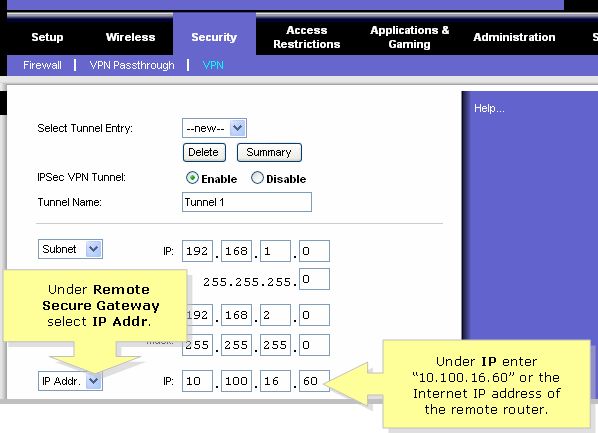 To verify the settings needed for your VPN tunnel follow the steps below. Access the gateway’s web-based setup page. Click Status and take note of the Internet/WAN IP Address. 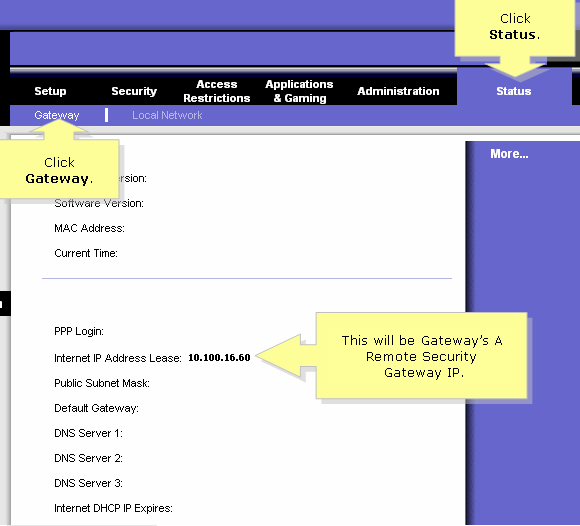 NOTE: Make sure the Local IP address of the two gateways are different. 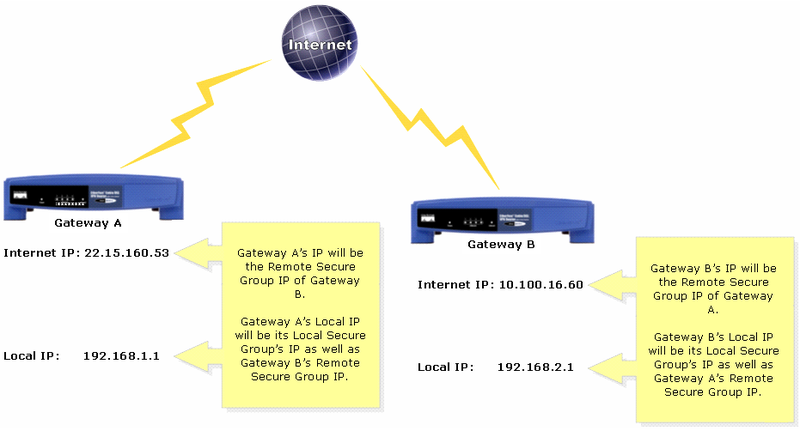 Take note that the Local IP address of Gateway A will be Gateway B’s Remote Secure Group. After verifying the settings needed to setup a tunnel, you need to configure the settings on Gateway A. For instructions, follow the steps below. On the Setup page, click the Security tab then click the VPN sub-tab. Select the Tunnel Entry you wish to create. 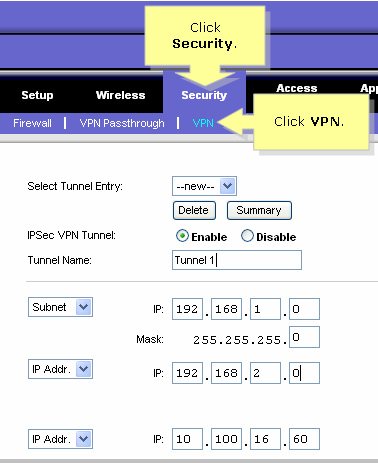 Look for IPSec VPN Tunnel then select Enable. Under Tunnel Name enter the name you want for your tunnel. In this example Tunnel 1 was used. Look for Local Secure Group and select Subnet. 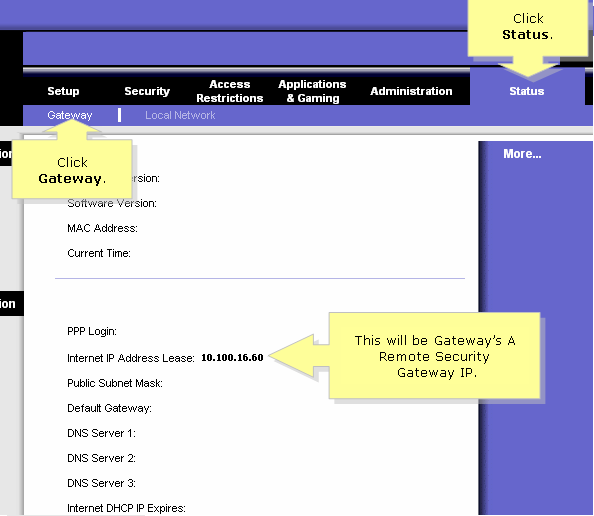 Then on the IP field, enter the Local IP address of your gateway. In this example “192.168.1.0” was used. 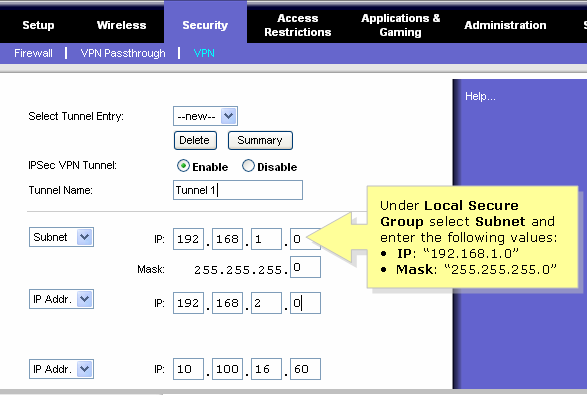 Look under Mask and enter the Subnet Mask of your gateway. In this example 255.255.255.0 was used. 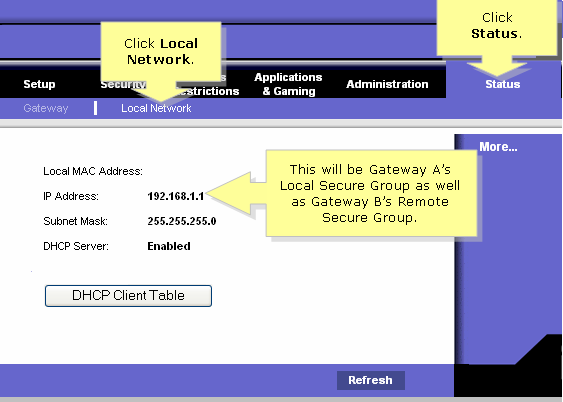 Look under Remote Secure Group and select Subnet then on the IP field enter the Local IP address of the remote gateway. In this example 192.168.2.0 was used. 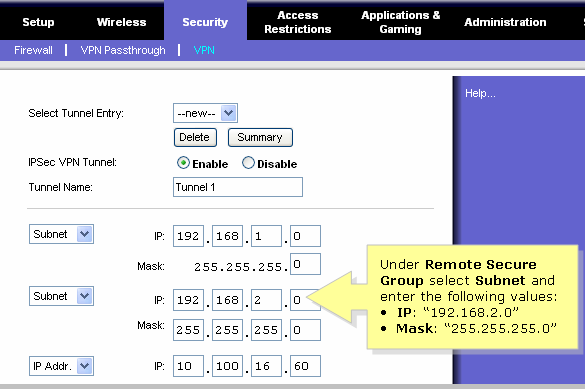 Look for Mask and enter the Subnet Mask of the remote gateway. In this example 255.255.255.0 was used. 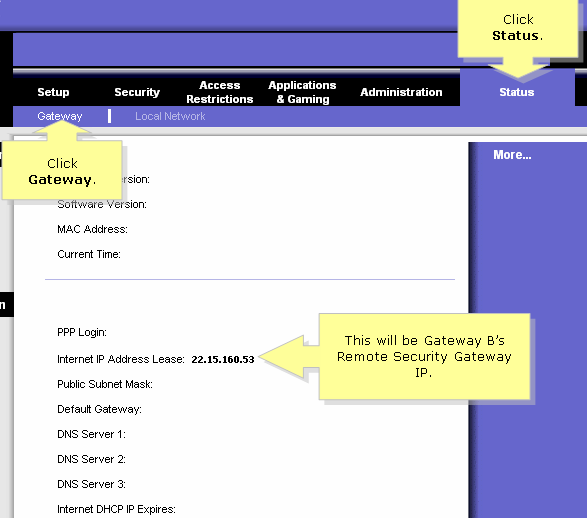 Look for the Remote Secure Gateway drop down menu and select IP Addr. Enter the WAN/Internet IP address of the remote gateway in the IP field. In this example 10.100.16.60 was used. Look under Key Management and select Auto (IKE). 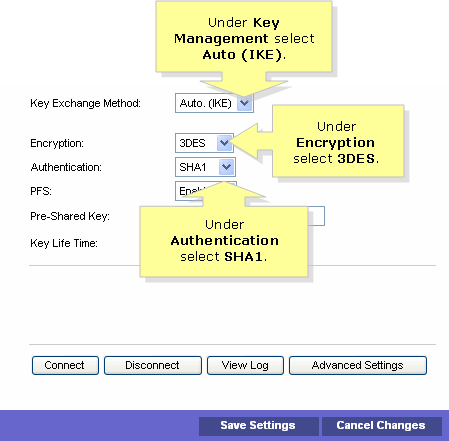 Look under Encryption and select the encryption level you wish to enable on your tunnel. In this example we used 3DES. NOTE: Make sure the Encryption level selected is the same with the gateway you wish to establish a VPN tunnel with. Look under Authentication and select the authentication mode you wish to enable on your tunnel. In this example we used SHA1. NOTE: Make sure the Authentication mode selected is the same with the gateway you wish to establish a VPN tunnel with. Make sure that PFS (Perfect Forward Secrecy) is Enabled. This will ensure the initial key exchange and IKE proposals are secured. Look under Pre-Shared Key and enter the key you want to enable on your tunnel. In this example MySecretKey was used. Look under Key Life Time and enter the time period you want the key to expire on your tunnel. In this example 3600 was used. 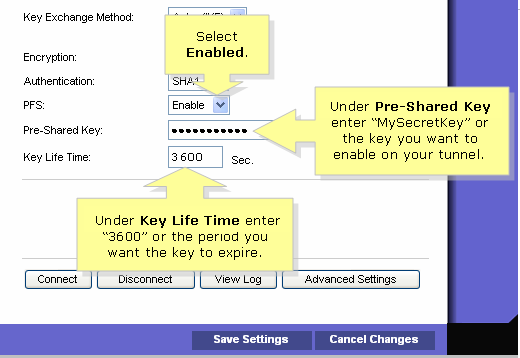 NOTE: Make sure the Pre-shared Key and Key Lifetime entered are the same with the remote gateway.